Pokémon Go was everywhere this summer. Seldom has any video game so completely permeated the cultural conversation, so quickly. It was in the headlines, police blotters, morning talk shows – even penetrating the impervious-to-the-passage of-time funny-page staple Family Circus. “Well, that’s one I didn’t even know was on my bucket list until just now,” laughs Don McGowan, BA’92, DipEnvironmentalStudies’94, LLB’97, BCL’97, when he learned about Billy Keane’s Pokémon-name drop. 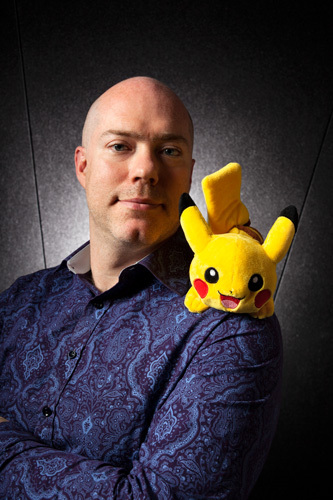 McGowan is general counsel for the Pokémon Company International, the folks behind the “pocket monsters” on Pokémon cards, Pokémon video games, Pokémon TV shows, Pokémon toys of all shapes and description, the Pokémon Go smart phone game and – as inevitably as Mewtwo crushes Magikarp – next year’s Pokémon movie. When he first began his legal practice after graduating from McGill, McGowan’s initial clients weren’t quite as colourful as Jigglypuff or Bulbasaur. He did stints in Stikeman Elliott and Osler Hoskin and Harcourt – both firms with large Montreal offices. A senior lawyer from Microsoft happened to be in the audience when McGowan made a presentation on privacy law at a legal conference in San Francisco. This was in the early 2000s, when governments and private companies were waking up to the potential and peril of Internet-enabled privacy breaches. Not long after, McGowan was working in Microsoft’s Seattle headquarters, consulting with their engineers on legal issues pertaining to data encryption. He eventually transferred into Microsoft Games Studios. There, McGowan was involved in a staggering array of legal issues – marketing, licensing, intellectual property, negotiating product placements for the games (and within games) and devising contracts with car companies featured in racing games to ensure that their vehicle’s performance was rendered accurately relative to their competitors. Gaming, already large at this point, had begun to explode into a major factor in the entertainment world, with game releases like Halo 3 pulling in bigger bucks than some Hollywood blockbusters. The work was broad – and sometimes very esoteric. “You know e-sports – online tournaments of video game players? It turns out that I was probably the first person to negotiate an e-sports contract,” says McGowan with a laugh. While still a McGill student, McGowan played an important role in a milestone event in the University’s history. He was one of the driving forces behind a student referendum to rename the University Centre after Star Trek icon William Shatner. “Tek War is my Atlas Shrugged,” McGowan explains, adding that he used to act out scenes from the Shatner-penned book for fellow students at Douglas Hall. After the victorious vote, the Students’ Society of McGill University began referring to the building as Shatner. The University, though, didn’t recognize the name change – the student vote had no impact on the University’s own official naming policies. The Shatner name has come to be widely used, though, and even a few senior administrators occasionally refer to the building as Shatner in unguarded moments. He doesn’t get the “Are they still around” question anymore. Pokémon Go has been downloaded onto more than 100 million phones world-wide. McGowan says that while he didn’t quite predict how enormous a hit the game was going to be, he had no doubt that it was going to be a success. Pokémon Go indeed flattened all competition and dominated playgrounds, water-cooler conversations and the thoughts of ‘wither Western civilization’ columnists around the world. But that isn’t what McGowan will remember from the summer of ’16. The game was designed to get people outside and interacting with their community. This article was originally published in the McGill News in September 2016.